Over the last few years, due to multicore and manycore processor trends, concurrency and parallelism have been written about a number of times. For many programmers, books play an important role relative to blogs or magazines simply due to the level of detail and breadth that can fit in a document with a generous page budget that is rigorously edited and technically reviewed. As some of my readers here may have noticed in the side bar off to the side of the posts (you probably can’t see the link if you get my posts via an RSS reader), I’m an author of one of these books, and wanted to talk a little about it here. I recently found out that the book is offered in a Kindle for Mac or PC edition, at a fraction of the price of the original, so I thought it would be worth discussing given the lower cost now available to potential readers. The book came out and was widely available in early 2010, and has been selling as well as I would hope with essentially no marketing. My hope is that getting word out via an article on here will lead to interested people noticing this project that took about two years to put together with my co-authors Tim Mattson of Intel and Craig Rasmussen of LANL (I started the book with Craig while I was still working at LANL). Why did we write the book? Our goal in writing this book was to provide a resource to people interested in concurrency and parallelism that took a bit of a different approach to the topic than other books out there. As I discuss in more detail below, we made a point of focusing on the topic without adopting a specific implementation technique or programming model, with a large dose of historical context and a grounding in generally applicable patterns that appear in concurrent code. I believe it is important to learn the topic through a general conceptual foundation rooted in the history of how technology today evolved from prior efforts over 30-40 years. In researching the current playing field of books in the area when I started writing, I asked myself “why don’t I find these books totally satisfying?”. The most common answer that I found myself coming up with was that the books were often heavily rooted in one way of implementing concurrent or parallel programs. For example, it is not uncommon to find a book that discusses the topic solely in the context of MPI, or OpenMP, or Java, or (insert your favorite library here). This is quite reasonable for a practitioner who wants to learn the theory of the area in the context of the specific implementation in which they plan to work. For example, I found a book on concurrency in Java (“Java Concurrency in Practice”) to be quite wonderful, especially if you were interested in then going to write Java code (which, at the time I read it, I was). Similar books exist for other popular systems, and even lesser known ones like ZPL (also, a very good book). Unfortunately, this mingling of general concepts with specific implementations of them can often lead to some generality being lost in the basic concepts. Often implementations adopt a specific way of approaching a problem leading to a skewed view on a broader topic. This isn’t unique to the topic of this book - a similar limited focus arises in other areas, like GUI programming, distributed programming, web frameworks, etc… Furthermore, it is quite common for libraries or languages to fall out of favor over time, either due to technology trends or simply a lack of maintenance in the specific tools. For example, the Parallel Virtual Machine library, a one time competitor to MPI, is no longer a serious contender for parallel programming - leading to many of the books that chose it as their implementation of choice to become similarly dusty and inaccessible to readers over time. Don’t start with the premise that parallelism and concurrency are intrinsically difficult concepts to grasp. As was recently pointed out to me when talking to someone about this at a conference, words like concurrent, simultaneous, contention, and so on, were in common usage far before computers existed. Unsurprisingly, this is because they come up in our daily lives quite frequently - in activities ranging from cooking a meal (which, I use as part of my argument that concurrency is quite natural in the book), to coordinating a meeting with a group of people, and performing “multitasking” at work. Concurrency is an intrinsic property of the real world, and humans are actually pretty good at managing it when it comes to physical and mental activities. Starting with this premise, and focusing on what technologies we have at hand, we can begin to understand where the difficulties actually lie. How often are they are due to limitations of technology and implementation choices versus inherently challenging properties of a particular problem to be solved? While it was inevitable that we would choose concrete languages to demonstrate examples, I set down strict criteria about the languages that were chosen. MPI isn’t a language (it’s a library), and it is relatively well covered in other literature. OpenMP on the other hand, is standardized and available to many programmers in multiple languages and resides fairly close to the language itself. Cilk represents a relatively mature extension on C that is very (very!) simple, yet very powerful. It was not surprising to see Intel buy Cilk++ a year or two ago. Erlang was chosen because it was well established and mature, and represented a fundamentally different programming model from the rest. 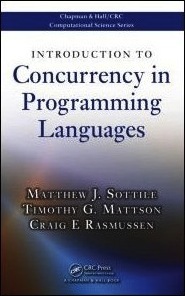 Other declarative languages have been in the news for their concurrency features, but they were still moving targets in 2008 when the bulk of the book was being written. Fortran was originally included (and the appendix that was cut from the book is available for free on the book web site), but was cut due to a likely limited interested audience. I put the appendix on the web site after the book was published since, while not a common-place language, Fortran 2008 actually represents a fairly modern parallel programming language. This surprises some folks, especially when the last they heard of Fortran it was peppered with capital letters, line numbers, and goto statements everywhere. It seems many people are unaware of the 1990, 1995, 2003, and 2008 revisions of that language that removed much of the arcane cruft and added relatively interesting new features. Provide a strong, language neutral conceptual basis. Readers really should learn about concurrency control and the corresponding types of problems that arise in concurrent systems before diving into any specific implementation. This is often given light treatment in books, and students must accumulate the knowledge by fusing concepts that they learn in operating systems, databases, distributed systems, and parallel programming courses. I tried to pull much of this together into a discussion that covered the essentials from all of these topical sources. This was rooted in my observations during a couple year stay at the University of Oregon as an adjunct faculty member where I taught parallel programming, operating systems, and distributed systems. Those courses were quite valuable in testing the material that eventually made it into the book. Some of my students from those courses provided great feedback when I was putting the material together (they are acknowledged in the introduction). Present the history - How did technology evolve to what we see now? This is probably the most fun part of the book to me, and I really think this is critical for any reader who wants to know and deeply understand the state of the art. The hot technologies of today are definitely not new – almost all of them derive directly from work that was performed in the past, and how those past efforts evolved into what we see now is very informative. History tells us what worked, why it worked, and what didn’t work. History is where we see technologies that went out of popularity due to trends in industry or technology, yet are relevant again due to technology coming full circle back to concepts invented decades ago. For example, GPUs bear a strong resemblance to vector machines and massively parallel computers from the 1980s. Unsurprisingly, the programming models popular today from NVidia and others are extremely similar to those developed twenty or thirty years ago. Programmers are not immune from the old saying, “Those who cannot remember the past are condemned to repeat it” – knowing the history of your technologies makes you a wiser software engineer and developer. Present examples in a framework that programmers can apply generally. The later chunk of the book is focused on applying what we discuss early on through a series of examples. Instead of laying chapters out in a specialized fashion (e.g., chapter on a web server, chapter on a parallel image processing algorithm, etc…), we chose instead to frame the examples in terms of a set of generalizable patterns that emerge in concurrent and parallel programs. By structuring the book this way, presenting concrete examples in the context of a generalizable framework for thinking about programming, we hoped to provide the reader with knowledge that was more easily applicable to problems they will face themselves. Two years on from finishing, I am glad we chose to write the book the way we did instead of falling victim to the temptations to either focus on technologies that may be passing fads or unstable and ever-changing research platforms. I think the book should have, forgive the pun, a long shelf life. I do hope you enjoy the book if you choose to grab a copy, and we are quite receptive to feedback for ways that the book could be improved if we ever get around to releasing a second edition. We maintain an errata list on the book web page, along with a set of source code examples, pointers to a variety of concurrent and parallel programming languages, and slides for those who wish to use the book in the classroom setting. And don’t take my word on the book - we’ve had a number of postive reviews! I keep a set of links to book reviews here, and currently have four up - the ACM computing reviews, Times Higher Education Supplement, InsideHPC, and Scientific Programming journal.